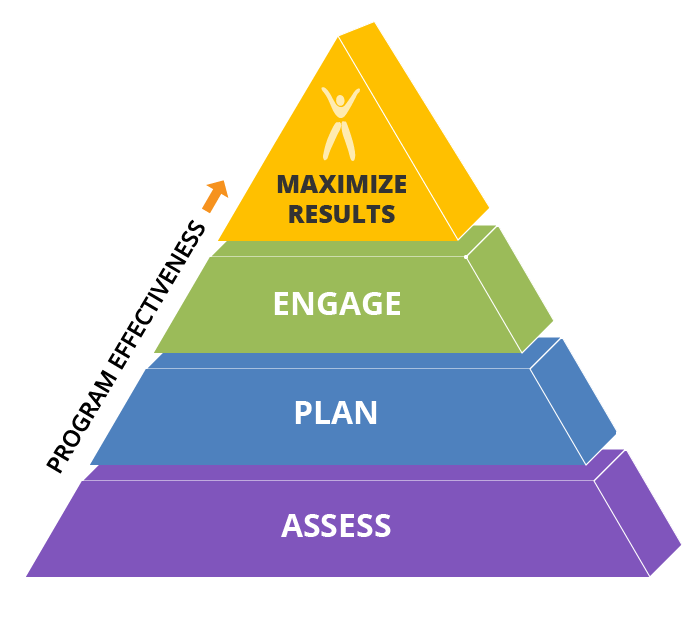 HPMI recommends a four-stage approach to net the best results from your well-being program. How can you know where you should go if you don’t know where you are? The most crucial part of any wellness program is gathering baseline information on your employee population. In this initial assessment stage, we administer health screenings, health assessments, health interest surveys, and a comprehensive cultural health audit to gain an accurate snapshot of employees’ interests and areas of risk. The results of your assessments inform program design, allowing us to tailor activities and education to your employee population. Creating a plan that will appeal to your employees while addressing their needs is key to a successful well-being program and, more importantly, fostering a culture of health. At the same time, we incorporate health and wellness activities and preventative programs you’re already paying for into your strategic plan. When it comes to well-being programs, participation is the measurement of success. HPMI engages your employees with a steady stream of fun, innovative activities that promote wellness, including group challenges, self-care materials, wellness classes, and health coaching. We’re always adding new, evidence-based program components to keep things fresh, interesting, and effective. Studies show that implementing a comprehensive wellness program can provide cost savings of $3-8 for every dollar invested. While some of this is measured in the hard costs of healthcare, increased productivity and the Employee Positivity Factor far outpace health care savings. The ripple effect of a positive and productive workforce translates to greater customer satisfaction, which shows in your bottom line.